The first time I ever ate Clams Casino (or had ever even heard of Clams Casino) was several years ago at a special birthday dinner (for me!) at a wonderful restaurant named Maroni’s in Northport, NY. My husband and I had the chef’s tasting menu and were served all sorts of dishes- some old, some new, all delicious! We especially loved the Clams Casino and I have been thinking about making it ever since. I had never bought or cooked clams before so it made me a little bit nervous. When Prudy of Butter, Basil, and Breadcrumbs brought this dish to Fiesta Friday at the Novice Gardener, I was excited to have a great recipe to try to make it myself. I loved that she included such precise instructions on how to clean and cook the clams. I adapted her tasty recipe; I adjusted cooking times, used Connecticut Littleneck Clams instead of Cherrystone Clams, panko instead of soft breadcrumbs, and added avocado oil. We enjoyed them with cocktails on a beautiful afternoon sitting by our outside fireplace. Great!! Note: The clams can be stored for a day in a bowl in the coldest part of the refrigerator. Begin by cleaning the clams. Rinse them thoroughly. Put them in a large bowl with very cold water, and stick the bowl in the refrigerator. This will give the clams the chance to spit out any sand or grit that may have gotten inside. After about 30 minutes (or up to an hour), drain the bowl of water, and refill with fresh cold water. Refrigerate. After the second soaking, scrub them with a kitchen brush. Cook the clams: Preheat the broiler to high (I set it to Broiler-Max, 500 degrees). Place the clams on a large, heavy baking sheet in a single layer. Place under the broiler, and broil for about 3 to 5, or until the clams have opened completely. Remove the baking sheet from the oven and reserve the clam juice that has dripped into the pan. Strain the clam juice in a coffee filter to remove any bits of shell or grit. Remove the clam from inside the shell with a spoon. Place on a cutting board and finely chop. Gently twist the clam shell at the hinged side to separate the halves. Clean any remnants of clam from the shell with a knife. Set the shells aside. In a large frying pan, cook the bacon until crisp. Remove the bacon to a plate lined with paper towels, and set aside. Discard all but two tablespoons of the grease. Add the finely diced red pepper and shallots to the pan. Sauté until softened; about three minutes or so. Add the garlic; and sauté for another minute, or until softened. Add the wine to the shallots and garlic mixture, and simmer until it’s reduced to about half, about 5 minutes. Remove from heat and add the chopped clams, breadcrumbs, ½ of the bacon, the reserved clam juice, melted butter, parsley, pepper, Old Bay seasoning, cayenne, and cheese to the wine reduction. Mix thoroughly. If you think it is a little too crumbly, you can add another tablespoon or so of melted butter, avocado oil, or olive oil until desired consistency is achieved. Salt and pepper to taste. Spoon the clam and breadcrumb mixture onto the clam shells. Top with remaining bacon. Put under the broiler for about 1 minute or until the bacon is sizzling and the top is golden brown. I’ve never bought or cooked clams before, but this reminds me of a great dish I used to get at my relatives’ Italian restaurant. They were just called stuffed clams, but so good! A squeeze of lemon on top and delish! I may try this when I’m feeling adventurous! This version was a lot like clam stuffing because of the bread crumbs. Bacon is the secret (or not so secret) ingredient!! I too was intrigued by Prudy’s recipe. How wonderful that you made them! Your version looks delicious too. I love that you made it your own! A good recipe is always adaptable, which this one proved to be. The vision you provided of eating these fireside sounds perfect! Josette…I’m so thrilled that you made the clams casino!! I’m flattered, really…because I truly respect and look up to you for the beautiful and delicious recipes that you share.. I love how you changed it up to make it your own.. panko? Oh yeah… perfect! And I almost bought littleneck clams until the seafood manager talked me into cherrystone because they were bigger! You are the best… you got me to make them! I have been saying that I was going to make them for years. I only had littleneck clams as an option… the larger shells would have been great. 🙂 Thanks for the recipe! I had clams casino once at a delicious old school restaurant in SF. It’s a place where the pizza takes an hour to prepare, so the chef sent us two plates of clams casino! They were amazing! I love your take on these with the crunchy and flaky panko bread crumbs. Scrumptious! 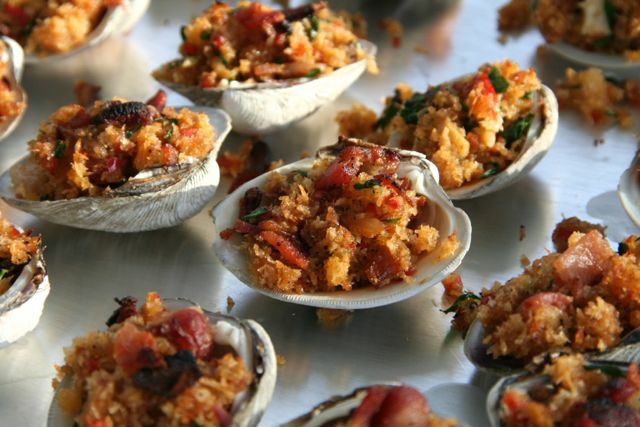 We don’t eat clams but these sure do look great! oh these look divine! Like you I have never tried cooking clams because I am nervous! But thanks to Prudy and your instructions, i think i am ready now to give it a try. This looks fabulous! These little guys were all open and cooked under the broiler in 3 minutes!! I agree! I think that next time I would add fewer breadcrumbs though. This looks great, Josette! I love that you added avocado oil. Yum! Oh yum, I need some of this in my life! OOh how i wish i could get fresh clams where i live. i would certainly make these!!! I was so scared to store them but supposedly they keep well in the fridge 🙂 Maybe you can get your hands on some! You do know that clams casino are Noah and my favorite appetizer right?!?! 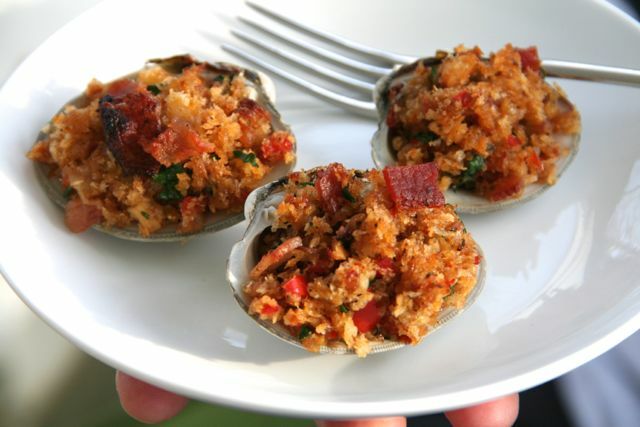 I love clams casino, have never made them but would love to try. Your recipe sounds fantastic.